The world of landscape design is limitless, especially in a place like Ottawa, where there are four distinct seasons to consider when choosing backyard designs that will suit your space. Landscape design should be beautiful, functional, easy to maintain, and add value to a property. It should be built to last, but also be something to build on over time. No matter what your favourite season is, here are five of the coolest backyard designs in Ottawa that don’t cost much, but often get overlooked. All of the following design ideas will enhance your enjoyment of your space, regardless of what the weather does. Add some architecture to your backyard landscape with the simple addition of a pergola. Pergolas are essentially rooftops on a set number of posts that provide an elegant way to go a little vertical and either provide shelter from a rainfall, or provide some shade when the mid-day sun hits. Use them to create a patio partition, or cover a hot tub, for example. Pergolas don’t need to look clunky or overbearing! Our team of landscape designers can use metal posts and veneer them with wood in such a fashion that we can eliminate one or two pergola posts from the middle of the patio. This is a very cool type of backyard design in Ottawa, and is considered a little secret here at Ottawa Home and Garden. Adding a natural stone wall to your backyard landscape design is another option that allows you to get vertical with your landscape design. These types of walls can add privacy and provide a really cool look to the space. But don’t stop with just a wall! By adding a water feature in the wall, you can create something that will truly separate your yard from everyone else’s. The look, the sound, and the design of this feature is something not many other homeowners are doing. Depending on the height of the wall, you can sit under or stand under the unit to cool off on a hot summer’s day, especially if your backyard is south-facing. A well-placed fire feature can relax you to the point where you can forget about the stresses of the day. Natural stone fire features are simply gorgeous, especially when they are custom-built. A precast fire unit or kit can complement the area’s interlocking stone beautifully. 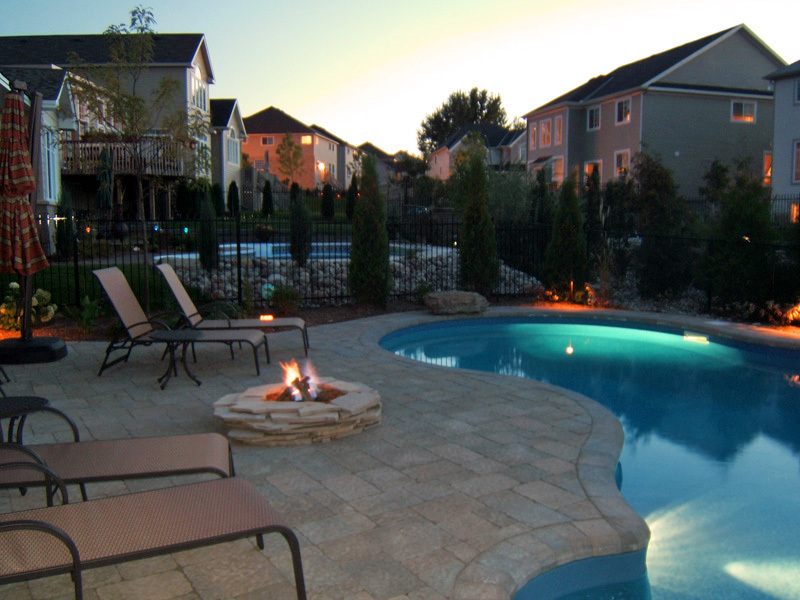 While fire pits and fireplaces are a bit more commonplace than natural stone privacy walls, they still add a customized look to your space, making it a one-of-a-kind backyard. Depending on how much room you have in your backyard, consider adding a storage solution for firewood and kindling made of a complementing material to the fireplace. When it comes to outdoor living, this landscape design feature is considered the cherry on top. An outdoor kitchen, wet bar, and/or food prep area becomes the focal point of the whole backyard. Whether it’s constructed out of natural stone, precast stone units or stucco as your veneer, you can create a social place to host your guests that fits within your budget and is as beautiful as it is functional. With just a few features within this unit, such as a small sink and a countertop, you can also have a space to prep all your drinks during your next summer BBQ. That being said, don’t overlook the idea of adding an outdoor pizza oven to the mix. Your guests will never want to leave! With the possibility of adding Wi-Fi and wireless electronics such as surround sound speakers to backyard designs, in Ottawa landscape designers and builders are now able to create areas and entire “rooms” outdoors that come complete with TV space and an outdoor stereo sound. Talk about expanding your usable living space! There is nothing quite like having an outdoor living room to enjoy watching the game outside under the stars. The family will also enjoy being able to watch their favorite movies outdoors until their hearts’ content. BYOBS (Bring Your Own Bug Spray). These are just a handful of some of the exciting backyard designs out there. They are all easy to achieve and add functionality and a timelessness to the outdoor living area. What do you think of our list? Do you agree or disagree? Do you have anything to add? If you’re in the area, contact the experts in backyard design at Ottawa Home and Garden today for all your landscaping needs!